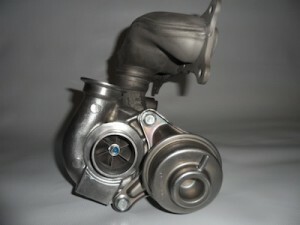 ModBargains.com offers GREAT Prices on our full line of Vargas Turbo N54 Stage 1 Hybrid Upgrades. Order Online or CALL 714-582-3330 to speak to one of our Car nthusiasts today. FAST & EASY SHIPPING! When Vargas Turbo created the Stage 1 Hybrid Upgrade for the BMW N54 motor, they didn't want to offer a product that was solely a replacement. Since the stock turbos have a notorious reputation for their wastegate arms and flapper valves starting to cause a rather annoying rattling noise after a little break-in time, Vargas Turbo replaced the stock ones with a stainless steel piece that will ensure you a tick-free turbo setup while preventing boost loss in the future. Also included in this kit are some brand new factory OEM waste gate actuators and a 14T wheel for higher boost all throughout the RPM range. And if you're interested in getting a little more power for your money, this kit has a TD04 upgraded thrust option that offers stronger internals that are installed into your stock housing. The upgraded thrust system includes a new alloy thrust bearing and a 30% increase in surface area on the rest of the complimenting thrust pieces. More surface area means there is more air flow, and with the new wastegate arms and flapper valves; you are guaranteed to get more consistent and reliable boost throughout your RPM range. Another option that is available is the VTX Billet Compressor Wheel option. This wheel is perfect for getting more airflow because of the extended tip technology. So if you're looking to get smoother and more efficient boost, this wheel will blow the 14T out of the water because of its bulletproof billet construction. So overall, this turbo system can either be a minor performance upgrade for your N54, or it can be a major power booster that gets your tires spinning without sacrificing your motor's longevity. Vargas Turbo made sure to account for just about everything that was wrong with the stock system and revamped it to stand up to the everyday wear and tear of road and track use. If you are interested in making an order for the Vargas Turbo Stage 1 Hybrid Upgrade for your BMW N54 motor, give ModBargains a call at 714-582-3330. Core Charge will be refunded upon receipt of cores (within 30 days) in accordance with Vargas Core Return Policy.